And they’re even more challenging when you’re dealing with the consequences of infidelity or addiction. Deep mismatch between the mood of the season and your current life circumstances. The pressure to be (and feel) joyful during the holidays is intense. Yet you’re feeling pain, anger, fear, or grieving the loss of the relationship you thought you had. If, instead, you had recently experienced a death in the family, no one would fault you for not being in the holiday spirit. The problem is, you’re not able to share what’s really going on in your relationship — or your authentic feelings — with most people. The “anniversary effect.” The anniversary effect is the tendency we have to revisit past events on their anniversary. You may recall events from last year or years past that now look very different to you today due to the new information you have as a result of discovery or disclosure. (If you’re struggling around how to reconcile your memories of events with new information, see my blog post “is my whole relationship a lie?” here.) Because it’s easier to remember events that are associated with certain special events and holidays, you may have vivid memories of specific incidents from the past that were particularly painful. Cultural and family expectations. Holidays are a time of great expectations. Cultural expectations can include attending social events, decorating, hosting get-togethers in your home, or simply feeling a certain way. Family expectations can run the gamut from gift-giving traditions, to how much time you spend with certain family members. The relationship challenges you’re already dealing with, coupled with the inability to share your struggles and pain can make these common seasonal expectations overwhelming. For example, if your partner had an affair with someone at the office, or his (or her) co-workers are aware of his infidelity, making a decision about whether or not to attend the office holiday party can be monumental. Holidays are a time of excess. Because holidays are a time of excess on many levels, you may be on heightened alert around the alcohol consumption of your partner, for example. Or you may struggle with spending too much on gift-giving to compensate for your own painful feelings, or the guilt you feel about not being as present as you would like to be with your children due to the consequences of addiction or infidelity. Disrupted schedules. When there’s is a disruption in schedules due to a holiday, vacation, or illness, good habits and routine can easily evaporate. If your partner is less engaged in recovery activities during this time, for example, you may feel triggered and fearful. If your self-care around food, rest, or exercise has been altered, your ability to handle stressful situations will be diminished. Be intentional about your self-care and make plans to have regular contact with the people who know about your situation and are supportive. Make a list of specific wants and needs you have for the holidays. These could include spending time with friends or family members, time to rest and reflect, or physical, emotional, relational, or spiritual self-care. Once you’ve identified your needs and wants, take action on those that you can fulfill yourself and make requests of your partner, if appropriate, around needs or wants you can’t meet on your own. If there is a specific incident (or incidents) from past holidays regarding your partner’s infidelity that now make it particularly difficult for you to enjoy the season, explore an amends or repair that you could request of your partner to begin healing the past. Give yourself permission to do what you want to do, what brings you joy, and to say no to things that don’t. If you feel particularly triggered by activities like the office holiday party or spending time with certain family members, give yourself permission to either decline the invitation or limit the time spent at the event. When you say yes to something that others want of you – that you don’t want yourself – it’s the same as saying no to yourself. Make a list of rituals and traditions you do each year. Eliminate any that no longer have meaning to you, no longer bring you joy, or are just time-wasters. Add any new traditions that you would like to incorporate into your holidays. 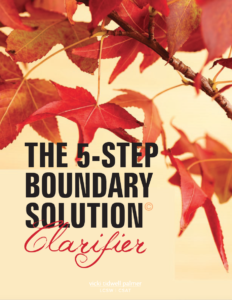 Create specific boundaries for yourself, if needed. For example, decide in advance how much you will spend on gift-giving, how much alcohol you will consume at a social gathering, or how much time you plan to spend with family members who are difficult or toxic. If you’re concerned about the boundaries of your partner, make specific requests of him/her. If anything happens this year that you know you either don’t want to repeat next year or you’d like to add next year, make a note to yourself on your calendar for next year to remind you so that you can plan accordingly. Wishing you a peaceful, grace-filled holiday season! p.s. Last night I spoke at the Outer Circle Club of SAA on Holiday Survival Strategies: 7 Recovery Mistakes and How to Avoid Them. Download the Holiday Survival Strategies Roadmap (for addicts) here.